Homeowners in Orpheus Road, Swansea, have been embroiled in a bitter row over where to park their cars on the well-to-do street. Branded the "Battle of Orpheus Road", residents have been fighting to get road parking spots directly outside their home. Tensions reached boiling point when some families - many with more than one car - were reportedly placing objects in the road to illegally reserve their spots. Eventually, the police were forced to remind residents that they did not have an automatic right to park directly on the road outside their home. South Wales Police said they were made aware of "friction" in the street in Swansea. 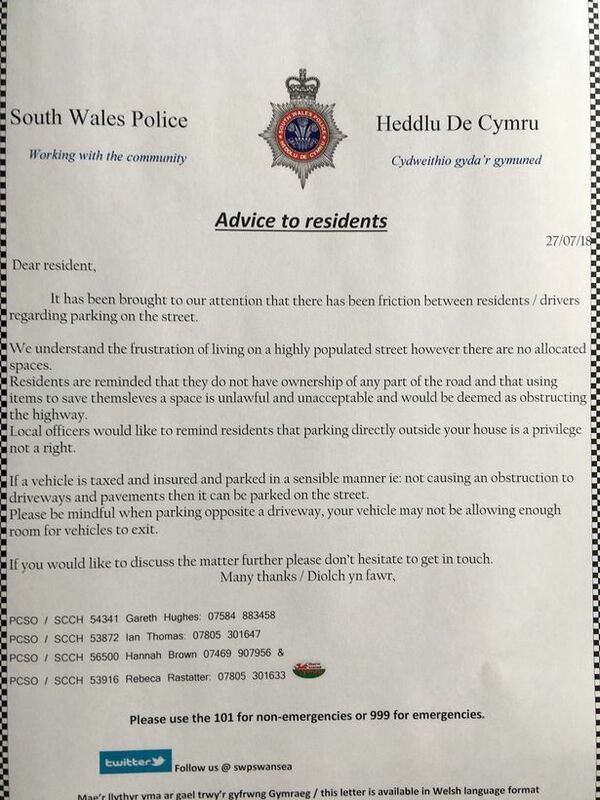 A letter has now been sent out by South Wales Police to tell neighbours they "do not have ownership of any part of the road." Neighbours say it has caused face-to-face showdowns over the Mercedes, Audis and BMWs lining up in the road - alongside the little family run-around Fiats and Fords. And some have been accused of using bollards and bricks to "reserve" spaces outside their own homes to blockade their neighbours. One furious neighbour, who asked not to be named, said: "It is a big problem here. Some people park and then go to work. "It is causing a lot of problems. I don't think the police getting involved would do anything. What can they do?" The bungalows on the narrow street all have drives to park - but it has seen people parking on grass verges and across neighbour's drives especially in the evenings and at weekends. Letters were sent out to those living on Orpheus Road and neighbouring Christopher Road by police. The letter reads: "It has been brought to our attention that there has been friction between residents/drivers regarding parking on the street. "We understand the frustration of living on a highly populated street, however there are no allocated spaces. "Residents are reminded that they do not have ownership of any part of the road and that using items to save themselves a space is unlawful and unacceptable and would be deemed as obstructing the highway. "Local officers would like to remind residents that parking directly outside your house is a privilege and not a right. "If a vehicle is taxed and insured and parked in a sensible manner, not causing an obstruction to driveways and pavements, then it can be parked on the street. "Please be mindful when parking opposite a driveway, your vehicle may not be allowing enough room for vehicles to exit." Ward councillor Robert Francis-Davies said: "There are too many cars on the road and it's a problem. "Nobody has a right to park on the road, everybody pays their road tax. "Where appropriate we have put in residential parking, but there's only a certain amount you can put in per road. "I would ask residents to work with each other - I'm sure there is enough for everyone."